"The view of the romantic Manila Bay sunset..."
ONE CENTRAL PLACE is one of the most perfect location that Megaworld has ever acquire, the location the "old SHELL MAYA", for us people of the 80's, shell maya is the best meeting place for appointments & transactions, it is very convenient because it is located on the corner of Sen Gil Puyat Ave. (Buendia) and Ayala Ave. I remember the old times that me and my friends meet there with our racing cars every Saturday before heading to Greenhils to show off our nice cars. Most of the guys who usually meet there are living on the nearby class A subdivision like, San Lorenzo Village, Bel-air Makati, San Antonio Village and others. 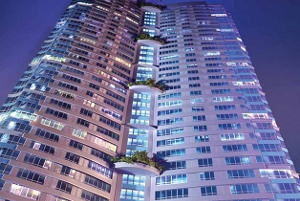 One Central Makati also has the nearest location to the LRT & MRT stations. Main toro fair is never a problem because all the major transport system like bus and jeepney are just across the tower.